From voaspecialenglish.com | facebook.com/voalearningenglish Colonial Williamsburg is a living history center in the state of Virginia. More than 1,000 of its employees work as historical interpreters. They demonstrate how 18th century Americans lived. One of them is Bill Rose. BILL ROSE: "If you have a good interpreter, you don't have to change the facts of history. They can make those facts palatable and enjoyable to a modern audience and help draw those connections. And I think that's the best thing in the world." The actors talk, work and look as if they lived in colonial times. For most, re-enactment is their full-time job and career. Jim Sutphin is director of historic programs at Colonial Williamsburg. JIM SUTPHIN: "It's their job, but it's also their passion to come and dress up in funny clothes, in 18th century clothes and interpret history for our guests." Before they start acting like an 18th century American, the actors receive training. Hope Smith plays a slave woman. In the 1700s, half of the people in Williamsburg were slaves. HOPE SMITH: "Doing what I do puts a human face on what was going on. You're able to see the Revolutionary War through the eyes, you know, of the specific character that I am doing. You're able to connect, you know, what happened to an individual through their eyes so it's not just these big events." Colonial Williamsburg is home to several businesses where re-enactors demonstrate 18th century skills. 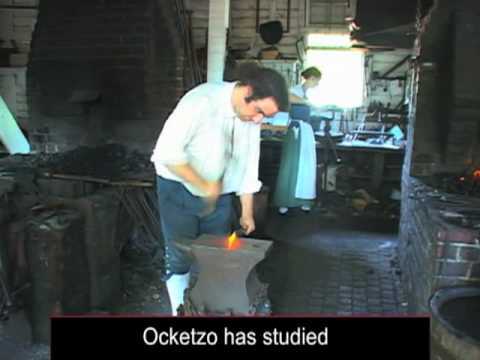 Matthew Ocketzo has studied blacksmithing. MATTHEW OCKETZO: "People have a lot of preconceived notions about blacksmiths. And it's interesting to see people come in with what they know, and tell them this is what we actually do, and to see how surprised they are when they realize what was going on." The blacksmith provides tools for the other businesses and cares for historic buildings. Matthew is happy to help carry on a tradition that goes back thousands of years. MATTHEW OCKETZO: "Today people go to jobs that they hate in offices and, you know, they just loathe being there. But every day in a blacksmith's shop, it's really engaging, fascinating, satisfying work to do." Visitors can see the re-enactors at Colonial Williamsburg all year long. The actors give meaning to a place rich in history and the roots of American democracy. I'm Steve Ember. Видео Visitors to Colonial Williamsburg Get a History Lesson in the Roots of US Democracy очень полезно в изучении английского языка. The US isnt a Democracy were a? Republic.